Recently bought a brand new pair of neoprene hip waders. 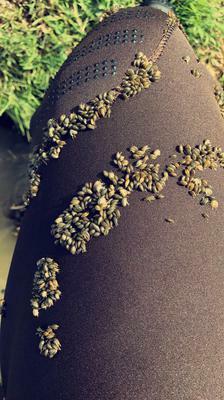 Once I came out of the lake from fishing I had numerous amounts of little water fleas on my hip waders. Are they attracted to the neoprene? I'm just taking a wild guess to say that it could possibly be that they were attracted to your body heat...? (or not). It could've just been a coincidence, too. They might have been moving about in the water, and then just happened to land on your waders. Regardless, that does seem kind of strange.